Whether you need great reference monitors for your home studio recordings, or simply want a better sound when you listen to your favourite T.. Whether you need great reference monitors for your home studio recordings, or simply want a better sound when you listen to your favourite TV shows of play games, the Mackie CR3 monitors will deliver outstanding value and quality. Built using only premium, high-performance components and featuring convenient front-panel controls, Mackie Creative Reference Multimedia Monitors deliver professional sound quality and features perfect for work, play and everything in between. Let’s face it… a lot of workspaces are cramped. Maybe you work at home, maybe you like to work remotely or maybe you sit for hours a day in a tiny editing suite. Either way, great-sounding monitors that don’t eat up a ton of desk space would be ideal. The extremely small footprint of Creative Reference monitors is perfect for the modern workspace. They are very compact, but they don’t sacrifice a bit on performance. There’s nothing worse than getting some cool new gear only to realize you have to head back to the store to get the cables you need to make it all work. 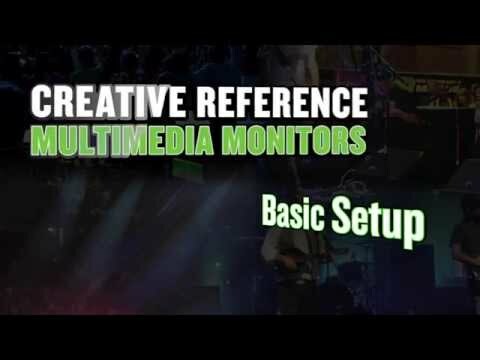 That’s why Creative Reference monitors come with absolutely everything you need to get started working or playing right out of the box… and then some. Loaded with convenient features, Creative Reference monitors offer flexibility that will save time and hassle. Unique to the line is a left/right speaker placement switch that lets you decide which side of your workspace has the volume control. Sometimes you just feel more comfortable reaching up to change the volume with a specific hand. Mackie is the first to solve this issue. Maybe it’s because there are so many ambidextrous people here…something in the Seattle water. It’s also fantastic for home studios, where you can be forced to put the powered monitor on a particular side due to where the power outlet is. Either way, you don’t want to sacrifice proper stereo imaging due to personal preferences or space limitations.